Kirsten has been around horses since before she can remember clearly. Her riding career started when she was six years old, when she took English riding lessons on a Shetland Pony mare named PJ. Kirsten got her first horse at 15, a six-year-old grey mare named Esperanza (Espy), who she rode and showed in the hunter/equitation discipline. In their first year of showing, Kirsten and Espy won championship at a local rated show. Their show career was cut short when Espy was no longer able to perform athletically without pain. Espy was diagnosed with PSSM2 through EquiSeq testing and was euthanized at 14 in August 2017. Kirsten’s main riding discipline is now dressage. Kirsten joined EquiSeq as an intern while an undergraduate at the University of New Mexico. She graduated with a Bachelor of Science in Biology in December 2017. 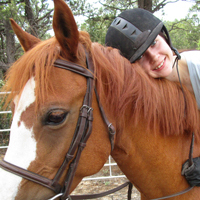 Her next goal is to get into a DVM/PhD program in pursuit of her passion of animal welfare. You'd be surprised to learn that ... Kirsten’s preferred dressage mount is a 12.3 hand Welsh pony.